I am taking the liberty of sending you a second video just four days following that of “O Come, O Come, Emmanuel” on Christmas Eve – because I encountered on the New Liturgical Movement website (www.newliturgicalmovement.org) what is, to me, an exquisitely splendid film of a Christmas Eve Mass celebrated in 1962, in the “Extraordinary Form”, which was, of course, the “Ordinary” form of its day. It is, to me, simply Heaven on Earth – Heaven come to Earth. Certainly, not all of us, coming from our multiple backgrounds and experiences, share the same sense and perspective of the Mass. Yet, as our culture has tended toward what is fast, instant and disposable, it has become increasingly difficult for many to enter into the comparatively lengthy, un-instant, un-disposable and indispensable depth of beauty and meaning that our Lord has poured into His creation – His new creation – demonstrated and lived in the video below. In my youth, the Passover in our Jewish home took several hours. The dried lamb shank on our Seder Table merely pointed to the One who was to come. Should not the reality be greater than the sign? 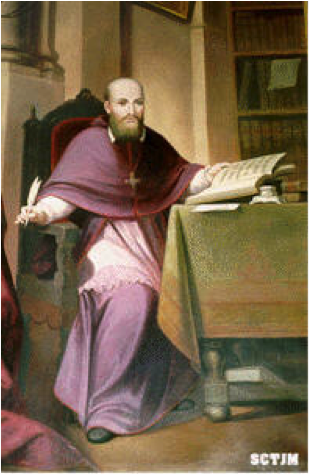 If we, as the Hebrew People of God, could spend two to three hours recounting the deliverance of our People from slavery in Egypt, should we, as Catholics – the new Israel of God – hesitate to spend such time at the Holy Mass which is the Passover fulfilled in the final Passover Lamb – the Lamb who delivered us from slavery to sin and gave Himself a ransom for many? Beauty takes time – time to see, time for truth and grace to penetrate the soul, time for the things of Heaven to invade, dispel and sanctify the things of earth, most especially our hearts. For those who love what you are about to see – and more, who take the time to enter in – I wish you every ounce and treasure of grace that the human body can hold. My love to you on this Feast of the Holy Innocents. May you enter fully into the love and adoration of the Son of God, who is God the Son – the Lamb slain before the foundation of the world. 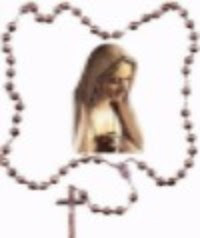 It is rare that I would send you an email pleading for all of us to pray the Rosary. However, I indeed do plead for us to trust the power of Our Lady’s intercession through the “weapon” she has given us to defeat evil. Who among us is not keenly aware of the evil that has come, not only upon our nation and the world, but upon millions of souls caught in the deception, blindness, and utter destruction of this very present and growing darkness. Dr. Mark Miravalle – husband, permanent deacon, and father of eight – is known for his international lectures on our Blessed Mother and a biweekly Mariology television show for www.airmaria.com. Dr. Miravalle is the author of numerous books, several of which helped me personally into the Church. I have met Mark and cannot recommend to you a more saintly and devoted heart for the Church and for Our Blessed Mother than this man of God. Just yesterday, I came across Dr. Miravalle’s video urging us to pray a million rosaries for the defeat of ISIS. I signed up immediately and urge you to consider the same. On Sunday, October 7, the Christian and Turkish fleets met in Lepanto Gulf, off the coast of Greece. The bitter battle finished with a brilliant victory of the Christians who were vastly outnumbered. That very evening Pope St. Pius V had at Rome a clear knowledge of this success. The same afternoon, the Confraternities of the Rosary, particularly in Rome, had marched through the streets in procession reciting the Rosary. This victory put an end to the naval power of the Turks and saved Christian Europe. To this day this victory has been attributed to the praying of the Rosary. The feast of “The Most Holy Rosary” is celebrated on October 7 now and the month of October is dedicated to the Most Holy Rosary. There was a home eight blocks (about 1 kilometer) from where the A-Bomb went off in Hiroshima Japan. This home had a church attached to it which was completely destroyed, but the home survived, and so did the eight German Jesuit missionaries who prayed the Rosary in that house faithfully every day. These men were missionaries to the Japanese people, they were non-military, but because Germany and Japan were allies during WWII they were permitted to live and minister within Japan during the war. Not only did they all survive with (at most) relatively minor injuries, but they all lived well past that awful day with no radiation sickness, no loss of hearing, or any other visible long term defects or maladies. Naturally, they were interviewed numerous times (Fr. Schiffer, a survivor, said over 200 times) by scientists and health care people about their remarkable experience and they said, “we believe that we survived because we were living the message of Fatima. We lived and prayed the Rosary daily in that home.” Of course the secular scientists are speechless and incredulous at this explanation – and they are sure there is some “real” explanation – but at the same time over 55 years later the scientists are still absolutely bamboozled when it comes to finding a plausible scenario to explain the missionaries’ unique escape from the hellish power of that bomb. After World War ll, the Allies turned over Catholic Austria to communist Russia. For three years the Austrian people endured this tyranny. Then, a Franciscan priest, Father Petrus, remembered how the Christians although greatly outnumbered had defeated the Turks at the Battle of Lepanto through the Rosary, and he launched a Rosary crusade. Through it 70,000 people, one tenth of the Austrian population, pledged to say the Rosary daily for the Soviets to leave their country. Austria was valuable to the Russians because of its strategic location, rich mineral deposits and oil reserves. Yet on May 13, 1955, the anniversary of the first apparition of Our Lady at Fatima, the Russians signed the agreement to leave Austria, and they did so without one person being killed and without one shot being fired. It is the only time that the militant atheistic forces of Marxism have ever peacefully left a country in which they held power. Military strategists and historians are baffled as to why the Russians pulled out. But we are not – it was the power of the Rosary. In 1962 there was a looming threat of communist takeover in Brazil. A woman there named Dona Amelia Bastos was known to have formed a Rosary rally among the Brazilian women there to do their part in opposing the looming threat. Their goal was simply to pray the Rosary in large groups asking the Virgin Mary for help in opposing the Communist takeover which the President of Brazil was leaning toward at the time. In Belo Horizonte 20,000 women reciting the Rosary aloud broke up a Communist rally. In Sao Paulo, 600,000 women praying the Rosary in one of the most moving demonstrations in Brazilian history, caused the President of Brazil to flee the country and not a single death was encountered, sparing the country from Communist takeover. The founder of Daughters of Mary, Mother of Israel’s Hope discusses her conversion from Judaism, religious habits, family life, and current social upheaval. Left: Presentation of Jesus in the Temple (www.motherofisraelshope.org); right: Mother Miriam of the Lamb of God, O.S.B. on Sept. 8, 2011, when the Daughters of Mary, Mother of Israel’s Hope became a public association of the faithful under Bishop Edward Slattery of Tulsa. Mother Miriam of the Lamb of God, O.S.B. 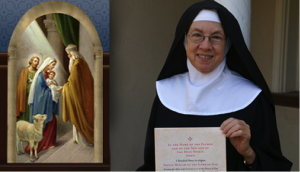 is founder of Daughters of Mary, Mother of Israel’s Hope (www.motherofisraelshope.org), a new religious congregation currently headquartered in the Diocese of Tulsa, Oklahoma, under the leadership of Bishop Edward Slattery. The former Rosalind Moss was born into a Jewish home in Brooklyn, New York, but converted to evangelical Christianity and then to Catholicism. She worked on the staff of Catholic Answers in San Diego for nine years, before leaving to found her religious congregation. Mother Miriam spent a year in Europe living with women’s religious communities to learn the basics of religious life, and is now interviewing candidates for her new community. She has had more than a thousand queries from interested women; she plans to select six by the end of the year who will join with her in establishing the community. 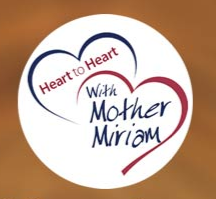 Heart to Heart with Mother Miriam is heard weekdays on Immaculate Heart Radio from 12:00 noon to 1:00 p.m. Pacific. Mother Miriam of the Lamb of God hosts the show which offers listeners encouragement, insight, and solutions to life’s struggles and challenges. Teach them to seek wisdom, not just knowledge. The most important thing about knowledge is how we choose to use it. That requires wisdom. Put wisdom first in the hearts of your children, so that their knowledge will serve humanity.